« Get your Babelgum invites here! Of my five WWDC predictions posted last week, at least one came true today: Steve Jobs announced a way for third party developers to build applications for the iPhone. “We have been trying to come up with a solution to expand the capabilities of iPhone by letting developers write great apps for it, and yet keep the iPhone reliable and secure. and we’ve come up with a very sweet solution,” Jobs told the audience gathered at the Moscone Center in San Francisco. Taking advantage of the fact that the iPhone runs a version of OSX along with full web browser support, developers can create web-based applications which, Jobs claimed, will be able to look and behave just like the applications built into the iPhone. Additionally, Apple will provide web developers with the hooks necessary to access many of the iPhone’s functions including dialing a call, sending email, and integrating with device’s rich client version of Google Maps. Anybody who can write modern standards-based web apps can develop for the iPhone, stressed Jobs. The news is a mixture of good and bad. The advantage of Apple relying on web-based application development as a way of embracing third-party apps is that anybody with the technical skills can create them without having to get the company’s permission first. In some ways the iPhone platform is now more open that it would be with a system where developers had to have their software certified by Apple first. However, the downside is that, despite what Jobs says, the applications that can be built by third parties won’t be as rich as those iPhone apps bundled with the device and built by Apple. It was only last week during his appearance alongside Bill Gates at the D: All Things Digital conference that Jobs promoted the virtues of rich client apps versus those that can run in the browser. Applying this argument to the iPhone, it’s hard to imagine how browser-based apps will be able to fully utilize the device’s multi-touch interface or its processing power. The second drawback is that these apps will have to run on a web server and so will need to rely on the user being connected to the Internet. How will Apple solve off-line access, if at all? Overall, the move is likely to be broadly welcomed by third-party developers, since apps developed will still be able to tie into some of the iPhone’s core functionality. However, having to be web-based and to run on a remote server, poses some serious limitations. Has it been announced whether iPhone will support Flash content? If so, development of Flash based apps via Flex will work. Flash support on iPhone has not been confirmed, and I’m doubtful it will happen. My reasoning is two-fold: First, Steve Jobs would have made a big deal about it today, surely? Second, YouTube is already converting its catalogue to Apple’s favored h.264 codec ready for AppleTV. Which would also suit the iPhone. I think the reason behind this is clearly Skype. Apple and Cingular do not want Skype to run on their phones. Thats also why most of the PDA phones available through Cingular do not have wifi, which should be standard. 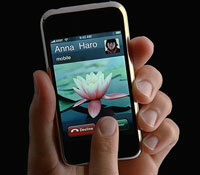 I agree Voice over IP would be a major block to Apple “selling” to iPhone to mobile operators. exactly, iPhone could be a very good device, without stupid mining of money, which smells like Bill Gates. Jobs should think about situation, if iPhone with apps like Skype wouldnt have much wider use, than now stupidly delimited device, because this is that one reason, why not to buy it. I thought that apple says that is five years ahead in technology.. So, why uphold archaic slow and expensive-to-use cellular networks? so:) from now it will be dependent on wi-fi and mobile network together? funny, but practical? or: it can buy only very good blinded people.. I thought that apple wants to create only sweet useful devices……..